It may be very hot or extremely cold outside, which can subject a child to serious exposure. Even when the weather is fine, left alone in a car at any time, a baby or small child is subject to the risk of kidnapping. What is certain is that whatever the danger involved, when a child is forgotten in her carseat, the risk is never acceptable. Failing to remember a child left alone in time can end in tragedy. How is it possible for a child to be forgotten in her carseat? Children can unfortunately be easy to forget during a day of multitasking, or when there is confusion as to which adult or responsible child in the car is supposed to be on car seat duty. Ironically, children can be abandoned in their car seats even by a large family. Also, children buckled into a car seat in the backseat can sadly be easy to forget by temporary custodians who are not accustomed to looking after a child on a regular basis. 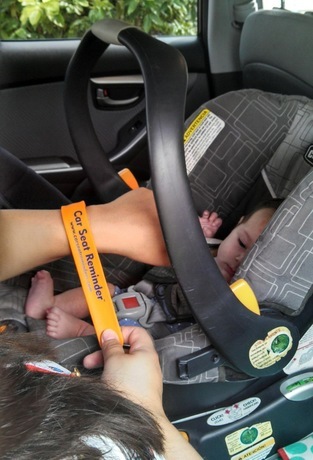 "If it's still on your wrist, the child is still in the car"
In short, this child car seat safety wristband is always on its carseat when the carseat is empty, and when your child is in it, this wristband is always on your wrist. Hence, if you are outside your car and you notice the wristband is on your wrist, or if anyone reminds you you are wearing it, you know to immediately run to your car. You have forgotten your child! A very simple concept that can save lives. This new business has been started by a daughter and mother team, Crystal and Karen Franco. It was inspired by their having recently read a number of sad news stories about children being left in cars, plus the fact Crystal has two daughters under a year-and-a-half old. The thought of making such a terrible mistake horrified her, so the idea of an extra special reminder, a CarSeatReminder, was born. So, if you want to play it as safe as possible, so that you never accidentally leave your child in her carseat, I recommend buying a CarSeatReminder.